Officers for the Life Boys from the left in white uniform - Lucy Hung, Joo Meng(? 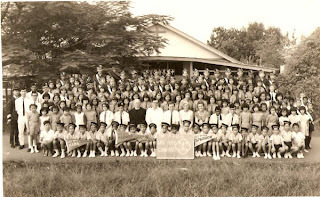 ), Mano(Rev Muthiah's second son) and Bok Chong(?). Question mark behind the names indicates confirmation needed. 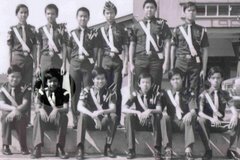 BB officers on the left side - Staff Sergeant, Lai Shing, Kok Ngee, Rajan and myself. Ms Richards and Lovell on the right side.